According to the latest news reports, the government of the Australian state of New South Wales (NSW) is going to use Blockchain technology to digitize its driver license program that is expected to be launched in November. The NSW government announced that it was going to conduct a pilot for about 140,000 new license holders in their state before finally rolling out the formal version in 2019. According to Secure Logic, the Australian tech company that is a part of this project, the idea is to use the Blockchain platform to underpin this effort and ensure that data is secured in a distributed manner. According to local media outlets, Chinese traders are still active in the cryptocurrency trading market. This is because these traders are using virtual private networks (VPNs) to avoid the bans that the Chinese government has placed on cryptocurrency trading platforms. The South China Morning Post (SCMP) reports that traders are also using the stablecoin Tether to gain entry and egress into cryptocurrency markets. When combined through a VPN, two Chinese traders can use a crypto exchange platform that is registered outside their country to trade cryptos for fiat currencies and vice versa. It seems that there were a number of crypto-based startups that had been looking at acquiring BitTorrent before TRON finally closed the deal. Besides just TRON and NEO, Icon, the governance-focused Blockchain project, as well as Protocol Labs, the creators of Filecoin, had also held discussions with BitTorrent in a bid to acquire the company. According to other sources, there were still another two unnamed crypto startups that were also in the running to acquire this company. Based on some internal documents acquired by the media, BitTorrent only initiated negotiations for its acquisition after the founder of TRON, Justin Sun reached out to BitTorrent’s biggest shareholder, DCM. Find out the details of this story here. 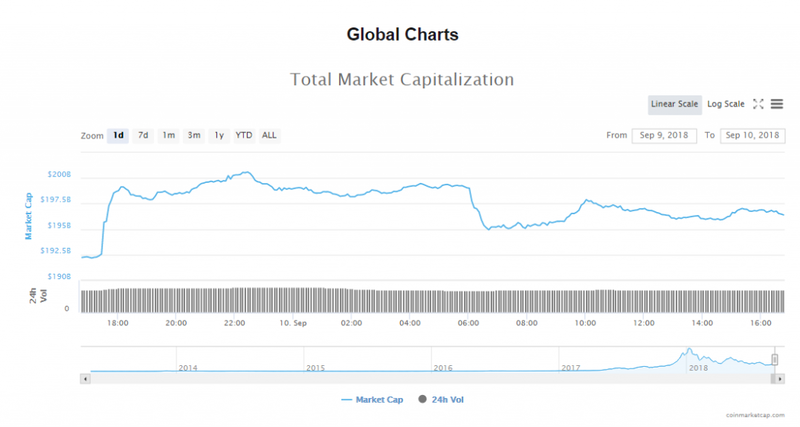 Trading volumes in the cryptocurrency market at the beginning of the week are at $11.29 billion, while the capitalization of the market is at $196.02 billion. Bitcoin’s current price is at $6338.24, a 1.67% climb in the last 24 hours. The digital currency’s market capitalization is $109.79 billion, with trading volumes of $3.73 billion. Ethereum’s trading price is $198.43, a 3.53% climb since yesterday. The market valuation of ETH is now $20.10 billion and its trading volume is $1.56 billion. 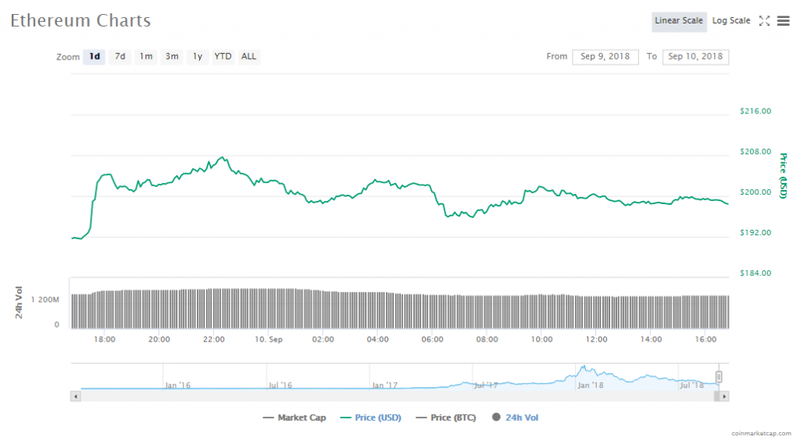 After the debacle last week that continued through the weekend, the cryptocurrency market has started this week on a slightly positive note. Most of the cryptocurrencies in the top ten list are up on their prices as well as capitalization, the 3 exceptions being XRP, which lost 2.17%, XLM, which dropped 0.98% and ADA, which fell 1.81%. 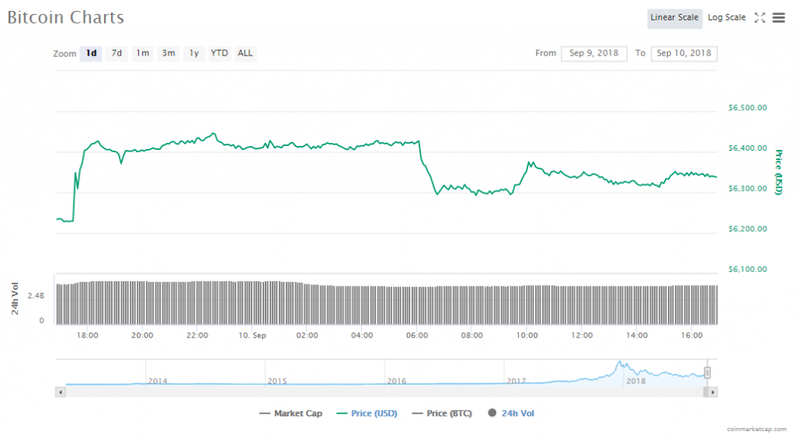 Bitcoin’s token price is now $6338.24, climbing 1.67%. The cryptocurrency’s market valuation is currently $109.79 billion. Ethereum’s token price is now $198.43%, climbing 3.53%. The cryptocurrency’s market valuation is currently $20.10 billion. Ripple’s token price is now $0.274300, going down by 2.17%. The cryptocurrency’s market valuation is currently $10.87 billion. Bitcoin Cash’s token price is now $481.03, climbing 1.26%. The cryptocurrency’s market valuation is currently $8.34 billion. EOS’s token price is now $5.02, climbing 4.24%. The cryptocurrency’s market valuation is currently $4.55 billion. Stellar’s token price is now $0.193439, going down by 0.98%. The cryptocurrency’s market valuation is currently $3.63 billion. Litecoin’s token price is now $54.18, climbing 0.91%. The cryptocurrency’s market valuation is currently $3.15 billion. Tether’s token price is now $1.01, climbing 0.56%. The cryptocurrency’s market valuation is currently $2.77 billion. Cardano’s token price is now $0.075495, going down by 1.81%. The cryptocurrency’s market valuation is currently $1.95 billion. Monero’s token price is now $107.65, climbing 2.27%. The cryptocurrency’s market valuation is currently $1.76 billion. According to Mao Shixing, the founder of the world’s third-biggest mining pool F2pool, between 600,000 and 800,000 Bitcoin (BTC) miners have shut down in the last two weeks due to the declines in token prices as well as hashrates across the BTC network. Long Blockchain Corp., previously a drinks manufacturer which now is a blockchain development company, has been subpoenaed by the US SEC (Securities and Exchange Commission). The subpoena was originally dated for July 10, and the company, during a filing on August 1, stated that the SEC had requested that Long Blockchain provide certain documents to them. The company refused to provide any further details. The controversial stablecoin Tether (USDT), supposedly backed 1:1 by the US Dollar, issued another 250 million Tether tokens on June 25, and now the expectation is to see another price increase in Bitcoin. Turkey instituted the country’s very first university level Blockchain center, with the aim to close the gap in expertise in the technology as well as facilitate greater deployment of the technology. The new center is called the Istanbul Blockchain and Innovation Center (BlockchainIST Center) and was launched at the Bahcesehir University (BAU).